In this, the 70th Anniversary of the end of WWll, the events of 6th June, 1944, hold as much fascination as ever and visitors still flock to the beaches of Normandy. The film that was made of the events of June 6th, 1944, The Longest Day, is still popular and although Hollywoodised and way too sentimental, there are truths in that piece of cinema that are still raw. The names still resonate down the years, Omaha, Utah, Gold, Juno and Sword beaches, Pointe du Hoc and Caen, as places of bloody battles and butchery. The Mulberry Harbours, the Bailey Bridges and the valour of the men who fought there throw a more positive light on what was the beginning of the end of that war, the invasion of Europe and the long slog towards Berlin. On 6th June 1944, Northern France saw the biggest invasion ever imagined when the massed forces of the Allied armies of the United Kingdom, America and Canada, joined with troops from Australia, Belgium, Czechoslovakia, France, Greece, the Netherlands, New Zealand, Norway and Poland, to defeat the occupying Germans. Few of these troops were more than 20 years old. Of course, there is more to see in Northern France that War Memorials and cemeteries, but on this visit, they took precedence over everything else. I still found time to enjoy the food and wine, to tour the odd Calvados distillery, to drink a Normany Kir or two, and to appreciate the fabulous Bayeux tapestry, but all that can wait for another article. Meantime, my mind is still stuck in that month of June 1944 when the fate of Europe hung in the balance and the youth of many nations died on the beaches during the D-Day Landings..
Normandy still bears the scars of the D-Day Landings, from the beaches whose names echo down through the years, Gold, Sword, Juno, Omaha and Utah, to the towns which suffered so badly, Caen and Sainte Mere de Eglise especially. The Allies had to ensure that all communications between the enemy forces were obliterated before the major attack began, so at 6.00 a.m. on the morning of June 6th 1944, in a bombardment that saw many towns completely wiped off the map, the bombing of the towns began, The city of Caen was a strategic objective but the armies were stopped to the north-west and west of the city by solid German resistance. The population was forced to flee their homes as the attacks and counter-attacks continued for over a month. It was not until July 9th, a month after the D-Day Landings, that it was finally liberated by the Canadians (who approached Caen from St. Germain-la-Blanche-Herbe). The Germans still held the right bank of the river and it took another ten days before the final part of the town was totally conquered. Today’s visitors can follow the history of the Second World War from its origins to the end of the Cold War by visiting the Caen Memorial in the town. In my view, this is the best Museum in Normandy, an homage to the suffering of the population and to the spirit of reconciliation which is the guiding principle of the Memorial. The Museum focuses on three themes, the Second World War, the Cold War and the Defence of Human Rights. Three bew exhibitions opened in 2010: World War - Total War, the D-Day Landings and the Battle of Normandy, and Opinion Spots which presents international events as depicted by international artists. Well worth a visit. Bayeux was the first town to be liberated in France and the only town in Northern France not to be totally destroyed.in the war. More often thought of as home to the famous 11th century Bayeux Tapestry, than a war zone, Bayeux was liberated by the Allies on June 7th, when British troops entered the town without opposition, having captured the coastal battery of Longue-sur-Mer. It’s magnificent cathedral and the famous Bayeux tapestry are still the focal points of most visits and as the Tapestry is now housed in its own museum located near the Cathedral, they are easy to visit in a morning. The nearby Arromanches beach had to be captured and prepared for the installation of the Mulberry Harbours. The Mulberries (artificial harbours) were to allow vehicles, men and supplies to land, and in 100 days, in one of the most successful operations of the war, 220,000 troops, 39,000 vehicles and 530,000 tonnes of supplies were landed. (The remains of the Mulberry Harbour can still be seen from the beach and the cliff). It was here that the Canadians troops who had taken the coastal defences in the Courseulles-Bernières sector (Juno Beach), and suffered 50% of their losses in the first hour of the assault, linked up with the other troops. The biggest British cemetery in Normandy is found in Bayeux with 4,648 graves and for those who have come to look at the D-Day landing beaches, a visit to this cemetery, Bayeux’s own War Museum, and the vast cemetery for over 10,000 US troops in Omaha, puts in focus the sacrifices made in these parts. The nearby Arromanches beach had to be captured and prepared for the installation of the Mulberry Harbours, artificial harbours which allowed vehicles, men and supplies to land. One of the great feats of the Second World War, these Mulberries, in one of the most successful operations of the war, in 100 days landed 220,000 troops, 39,000 vehicles and 530,000 tonnes of supplies. (The remains of the Mulberry Harbour can still be seen from the beach and the cliff). The beach had to be captured in order to link up with the Canadians who, in taking the coastal defences in the Courseulles-Bernières sector (Juno Beach), suffered 50% of their losses in the first hour of the assault. Above the beach at Arromanches is a circular cinema, Arromanches 360, which looks over the remains of the artificial port. Visitors to the area should be sure to see a screening in this unique film house where they can see previously unreleased archive images from Canada, Germany, UK and French collections retracing the 100 days of the Battle of Normandy. These images are projected on nine screens in the circular building that immerse you in the heart of the fighting, allowing everything to be seen “in the round” over 360 degrees, in a session that lasts 35 minutes. Prices: Adults: €5: Students/Children/Seniors (over 60 years): €4.50: Children (under 10 ), veterans: free. The Mulberries (artificial harbours) were to allow vehicles, men and supplies to land, and in 100 days, in one of the most successful operations of the war, 220,000 troops, 39,000 vehicles and 530,000 tonnes of supplies were landed. (The remains of the Mulberry Harbour can still be seen from the beach and the cliff). Your comments deserve to be read, Frank, but I don't think the war in Italy - or Sicily - has been forgotten. 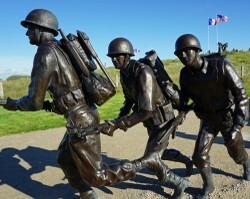 A lot of attention is being paid to D-Day this year because of the Anniversary. My brother in law fought his way from Libya, up through Sicily, into Italy and was involved in scenes too terrible to relate. (Anyone who needs to know something of this should read the Norman Lewis "Naples '44" book for a good overview). It's the same with the war in Greece. The men who have really been forgotten though, are those who fought in the Korean War, I'd like to see a lot more published about their time there. As ever, full of interest. Stunning photographs. Even with bombing in Britain I still feel that we don't understand the impact war has on your own territory. I have to put this online: it was my father who discovered that Rome had been evacuated by the Germans. Dad's troop raided Rome, and they went deeper and deeper into it, expecting to be attacked and fight their way out, if they could, becoming more and more afraid. Eventually an old man called them to a halt and as Dad spoke Italian, he had to interrogate him, and was told that the German had evacuated the city. Relief. Sorry to be saying this, but when I hear about D.Day and its heroism, I am incensed that my father and his comrades are forgotten. Please note, my father's unit, Reconnaissance Corps, were fighting in Africa and Italy ahead of D.Day and were offended by accusations that they were D. Day dodgers. They and the British Army pinned down a large German army at the Brenner Pass on the Austrian border, enabling the D.Day armies to invade France more easily. Please celebrate those who spent years fighting before the horrors of D. Day. My father was at the Battle of Monte Casino, where he went for seven days without sleep and lost comrades. The fighting in Italy was grim, brutal, but oft-forgotten. He spoke to me of it, but I do not want to say any more. Excellent in every way. Great information and those pictures are so good, especially the Bayeaux ones. I didn't know any of that about Arromanches and the Mulberry Habour. ty for posting . Where are the war poets? the newspapers asked on the outbreak of the Second World War. "Under your noses" said writer and critic Cyril Connolly. And so they were.